The last event of the year for us was yet another Southern Slingshots event. We were asked to race at the Goodguys event in Charlotte, NC. 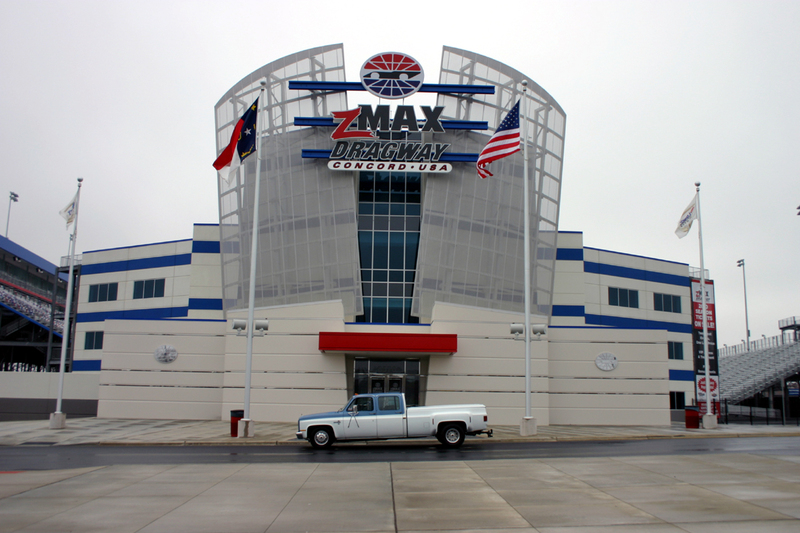 Yes, the one and only, 4 lane Zmax Dragway. The facilities are as impressive as advertised. They are a true testament to the phrase ?I don?t care what it costs." (and really mean it) There was much excitement in the air as all of the teams congregated outside the gate. Our enthusiasm was somewhat tempered by a racing surface that only had minimal prep. It was possibly the slipperiest track we have ever tried to race on. Our fervor was again diminished after "Bullet" Bob Reed lost control and wrecked his original/famous 68 Hemi Dart super-stock car in the top end. Bob injured his ankle, but was much more upset about the car. (Typical racer) Thankfully, the decision made to spray the track. Cautiously, we decided to back off the timing and to lower the tire pressure. Not wanting to take any chances, we expected to do a good burnout, and lift at the first sign of trouble. Even though while backing me up after the burnout Jennie said she still couldn't feel the usual "stick" under her shoes that she normally does, she and Brantley did an excellent job of aiming the car into the groove. Our second pass was not as pretty. 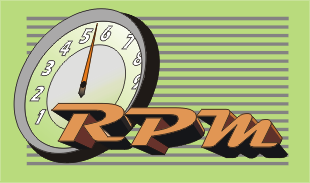 At the top of first gear, it began moving all over the place and got on the rev-limiter. After lifting off the throttle and slapping the shifter into high, the car straightened out so I hit the pedal again. The resulting 7.85 @ 183 was still plenty fast enough to get the adrenaline flowing. We once again ended our day with a fantastic dinner and Christian fellowship with Dennis Ivory, Jim Lyle, and Doug Miller. It certainly reminded us of the now famous "Italian Victory Dinner" in VA. The next day all the Slingshot teams traveled 60 miles North to the home of Mike and Laura Gray (Mountain Mike's Moonshine Express car) for a picnic of epic proportions. We are all still full from a meal that included North Carolina Bar-B-Que that melted in you mouth, a plethora of homemade side dishes and gorged ourselves with 5 gallons of homemade ice cream! Mike and Laura are two very special friends. Along with being gracious hosts, they are very talented in dozens of ways. They are tough competitors on the track but maintain a giving sportsman attitude. They are real examples to us of how to practice the ?others first? teachings of Jesus. We would certainly be amiss if we did not take an opportunity to thank all of the people that made this year possible. Darryl, Trish, Zach, Nate, and Rachael Moser, thank you so much for the inspiration you all provide. 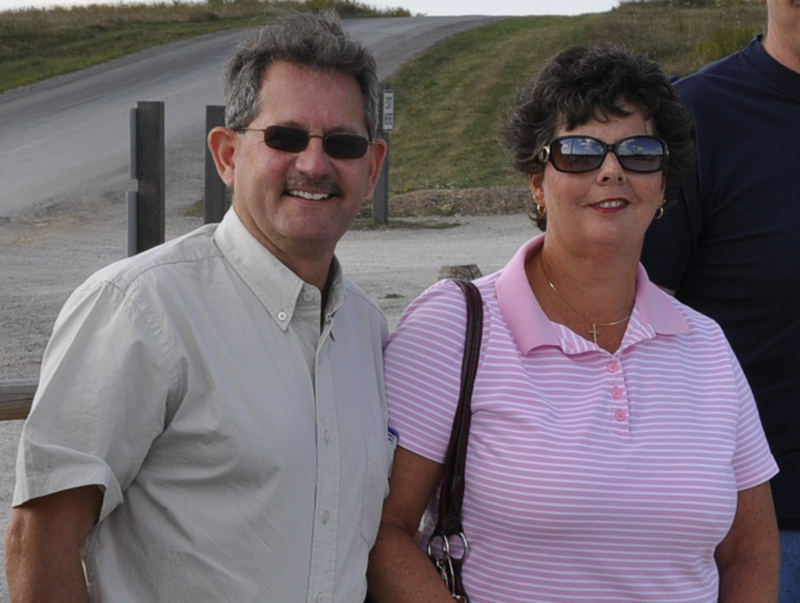 Scott and Lesa Trent, words can not express how much we value your leadership and guidance. Brantley, Todd, and Tyler, there is no way we could do it without all your help and friendship. It is not possible to thank you enough, Dennis, for your willingness to share your time, talent, and heart. Love ya, Brother! 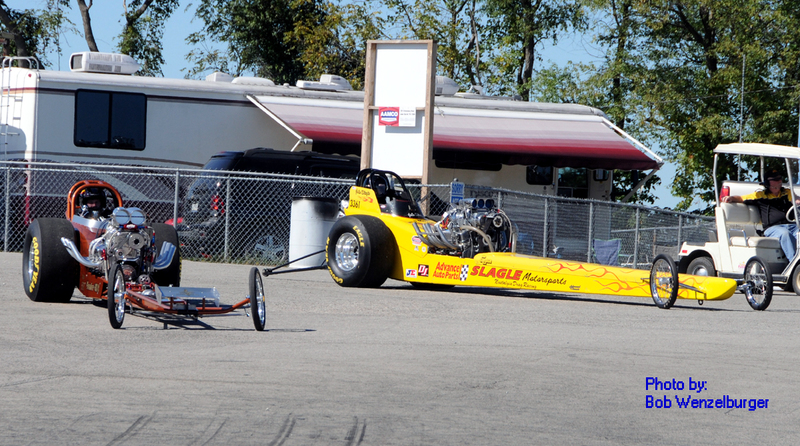 On the 19th of September, we enjoyed spectacular weather at Pittsburgh Raceway Park's annual nostalgia/PID reunion race. We forgot how nice it is to travel just one hour to a race. Most of the Southern Slingshots events are well, in the South...WAY South! The close proximity to home allowed for many of our friends and family members the chance to see the team in action. The conditions were great! Blue skies, mild temperatures, and a track with BITE! Our opponent, John Slagle, is not an official member of the club, but was gracious enough to bring their families? beautiful car to even out the field. If you follow the Goodguys VRA series, you probably recognize the car. It?s one bad hot rod! Dennis and Martha Ivory made the trip all the way from Church Hill, TN to spend time with us and take photos. They are talented photographers, inspiring Christian mentors, and very special friends. Dennis shows his skill at capturing fast moving objects in a very loud environment! We discovered that this day was no ordinary day. 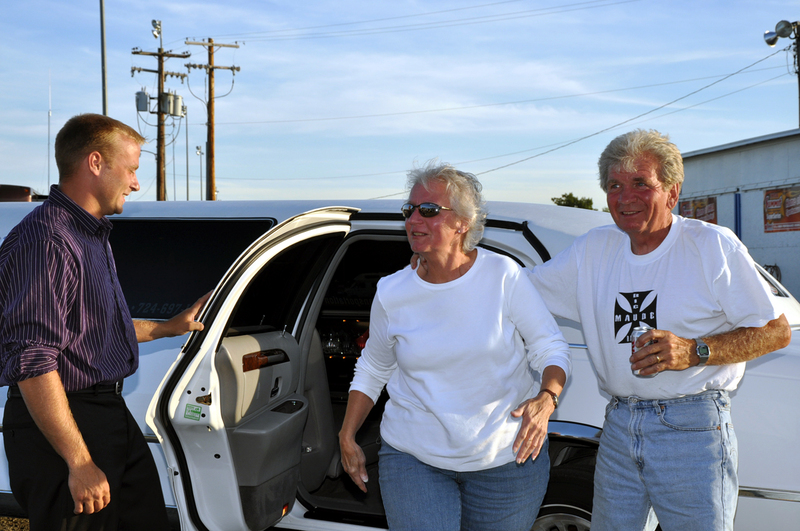 One of the Southern Slingshot teams (John and Nikki Crawford) was celebrating their 45th wedding anniversary! We needed to do something special to mark the occasion but only learned of this news after we arrived at the track. As all of the teams were conspiring to formulate what to do, a limo rolls through the track entrance. It turned out; the track manager owns a limo service. After his driver (his son) finished up the appointments for the day, he came to the track to check out some of the old cars. I approached him about the possibility of giving our special couple a trip down the track in style. With permission of the track management, the limo pull up to our pit area, picked up John and Nikki, and paraded down the strip as the final ?pass? of the day. This unplanned experience was definitely the highlight of the day for us. We could not have scripted a better ending to a great day. In spite of some disappointments in the MyChron series race at Numidia a few weeks prior, Nate was in a good frame of mind when he arrived at the Maple Grove Junior Challenge Race. 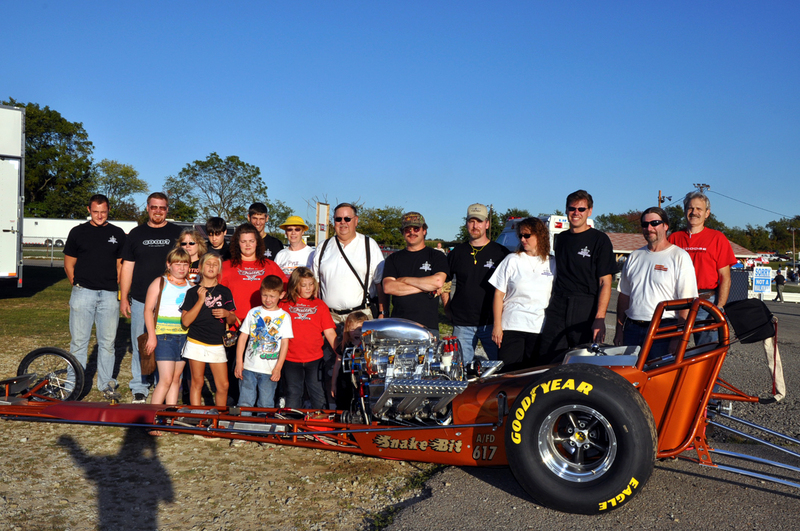 The race was held on October 11th together with the National Dragster Challenge. The juniors were broken down by age class. 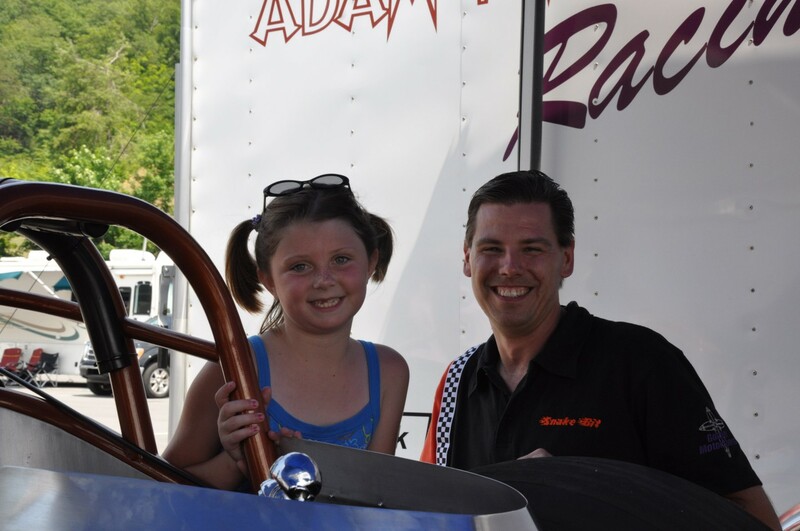 During the first round Nate drew Madison, who he had lost to at the Numidia race. They left the line, and proceeded to the finish only to find that Nate ran a .552 ET, quite impossible. Looking at the slip, Nate had a .001 light, but there must have been an obstruction in the timing to trip the finish line. The track officials decided a rerun was in order. This time Nate ran 12.995 on his 12.90 dial and a .040 light was good enough for the next round. With the good lights, Nate scored a bye in the next round into the Final! He had a tough competitor in the final with Matt Witkowski. Nate had a great reaction with a .004 light and ran 13.01 on a 12.92 dial which was good enough for the event win. Although the season was short, the blessings were many and this ended up being a great capper. With the great time experienced the prior week, the Gospel Motorsports team headed back to Numidia Dragway for more bracket racing. 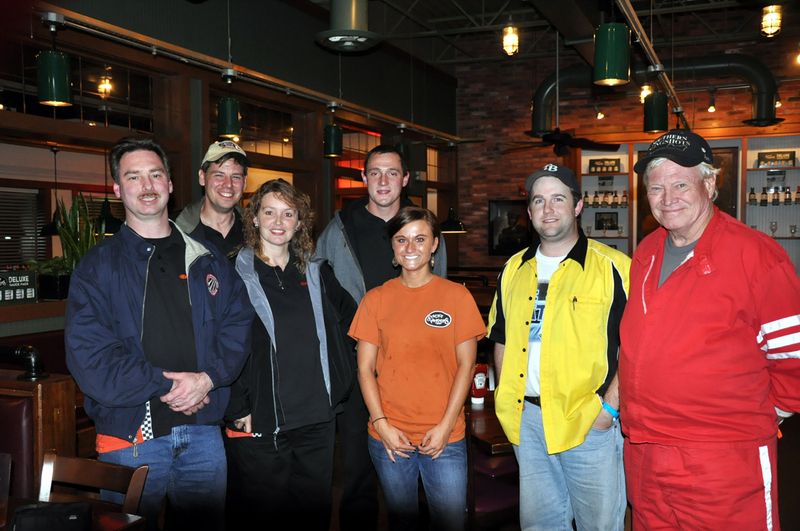 What unfolded was a great discovery of fellowship with the riders from Vreeland's Harley Davidson who were there for the East Coast Harley Drags event. We arrived at the track at 8:45 for a 9AM time run. We knew we had to hustle to make the first call, but after getting the cars unloaded, the announcement came over the loudspeaker that the power was out from 9PM last night until 8AM and they would not be ready to race until 11AM. OK, plenty of time to get ready. After prepping the cars and listening the rustle of a few well tuned Harley motors that were warming up, we decided to take a walk to see the other racers. There was a large rig with quite a few bikes setup when I noticed the ?got Jesus?? sign on the back of the trailer. Was this extra time a coincidence? After looking at the bikes and seeing the Christ in Action decals, it was time to find out more about this program. At that point I met Rich Vreeland who explained to me what Christ In Action was all about and how they offer the service during catastrophes for those in need. He also shared his racer?s card with his testimony on the back. We bench-raced about Jesus for a bit when Rich needed to take a phone call. I took a few more photos and met Buck. Buck noticed the focal point of my lens being set to the Jesus decals and commented about the cool program. After talking I learned that Buck had been through an incredible series of events before his eyes opened to the Lord and led him to a new life. Buck reminded me of the true meaning of being born again as we shared a number of Biblical applications to our lives. It was time to get busy for the race, but before we got too far into the program, we needed to drop off the Gospel Motorsports shirts and material at Team Vreeland. Rich stopped by with the shirt on as he headed to make another series of passes on his fast V-Rod. I immediately got an appreciation for the power his bike was making as he clicked off a 9 second run. Between rounds, Rich introduced me to Dr. Denny and Sandy Nissley who had driven up from Manassas VA to meet up with Rich and see the event. 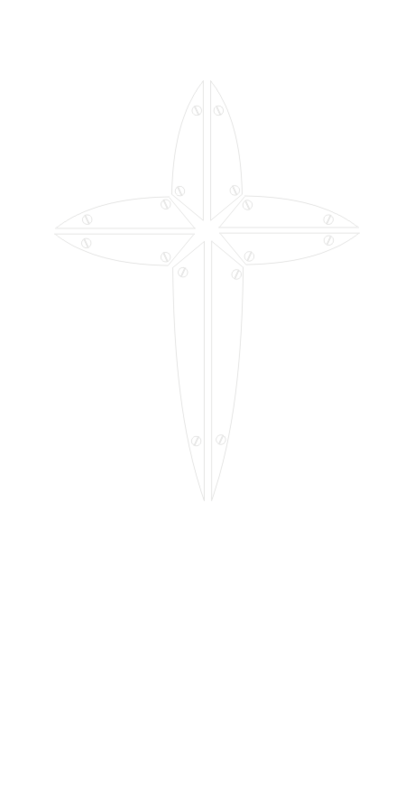 After getting back to an internet connection to see their website, it is clear that this organization on track with Jesus? challenge to us all. Check them out at www.christinaction.com. We had a good day racing, but we mostly enjoyed rooting for the bikes with the CIA and ?got Jesus?? logos. The ride home was long, but gave a great time to ponder the role we can provide in serving our Lord. Although the racing schedule has been sparse this year, when the opportunity presents itself, there always seem to be a bounty of blessings that come the way of Gos pel Motorsports as was the case on the July 4th weekend. Even without getting on the track, the weekend provided a time reminiscent of origins of Gospel Motorsports. After struggling with Nathaniel?s junior at the first race of the year and losing a clutch down-track, the team took some time off, regrouped and on the first pass at Maple Grove on Saturday, Nate cut a .011 light and ran a 12.94 making for his quickest pass and continuing a nice string of lights from his earlier race where he cut a .010 and a .004. For the first round of eliminations, the car was dialed at 12.90 and Nate did a great job by cutting a .013 light with a little pedaling at the top end and managed a win. 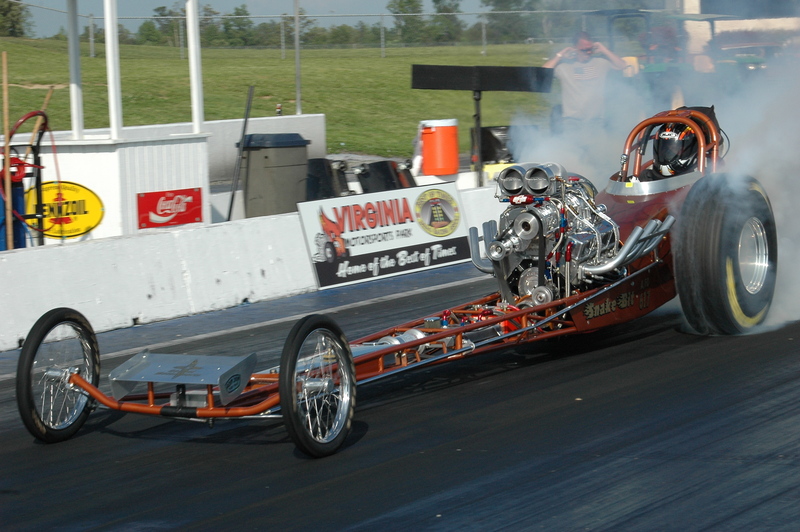 Next round he ran 12.895 and broke out by less than his opponent as he headed to the third round facing Jimmy Fizz. Jimmy and Nate both cut respectable lights, but the 12.90 car fell off a bit for the loss. In all it was a great day for Nate and a 12.90 car running in the all-run format. Shepherd of the Hills Church presented its third annual Father?s Day Fellowship Car Show and challenged the threat of rain and managed a great time, good turnout and finished with great weather. A number of new vehicles made their way to the show this year while a number returned to provide a great core of cars representing diversity in manufacturers and styles. 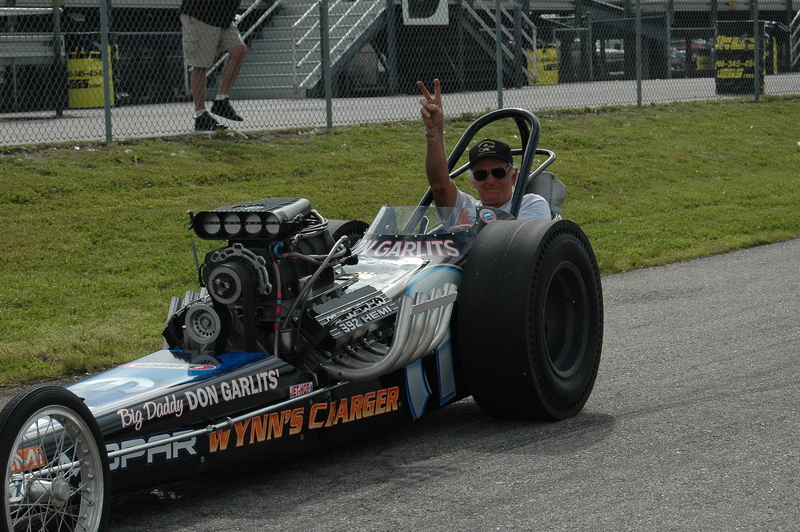 The new vehicles included a front-engine dragster from George DeSaito who is a member of the Southern Slingshots? organization and also races at nostalgia races in the area. Also new this year was a Shelby Cobra, ?63 Pontiac Catalina, a beautiful hot rod ?61 Corvette with dual-quads and nitrous, an ?81 Corvette with a prism paint scheme, a 10 second street driven Camaro, and a couple of workhorses in the form of restored tractors. New to the event was the ?What Would Jesus Drive? contest where the winner w as determined by Pastors Brown and Whitmore from Shepherd of the Hills. Gordon Moser won with his Farmall H that was restored to new condition relating to Jesus' parable of sowing seeds. The scooter races once again drew great participation with three classes. The youngest were either able to use a scooter or be pu lled in a wagon by external horsepower (usually their parent) to participate. This class was uncontested as a winner as every participant received a Hot Wheels car for their efforts. The next class was Junior Fuel and was based on the Razor two-wheel scooters. Trent Wilson took the win in this class, go ing a few rounds and winning the Gospel Motorsports t-shirt. 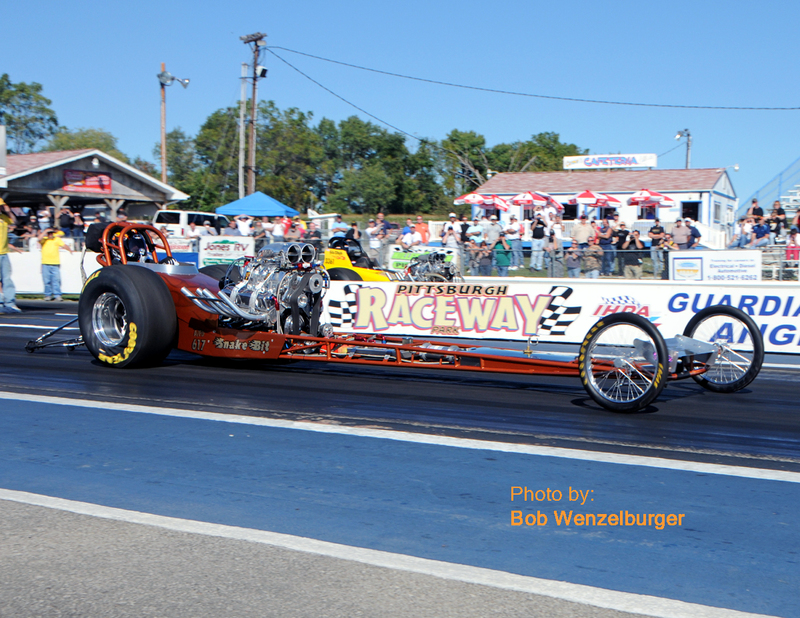 In the Top Fuel (adult) class, XXXXXX won receiving a $25 Sunoco Gas Card for his efforts. The hot dogs were once again expertly grilled by the duo of Neil Schueck and Brad Smith as the crowd of well over 100 was served with beverages and donuts. Our thanks goes out to Shepherd of the Hills deacons, pastors and congregation who supported this event. We are also thankful for Adam Pyle?s assistance in providing an inspiration and his participation at the event. We are looking forward to next year and hope for a better weather forecast as we seek to grow again. Bristol - Blast from the Past 2009! 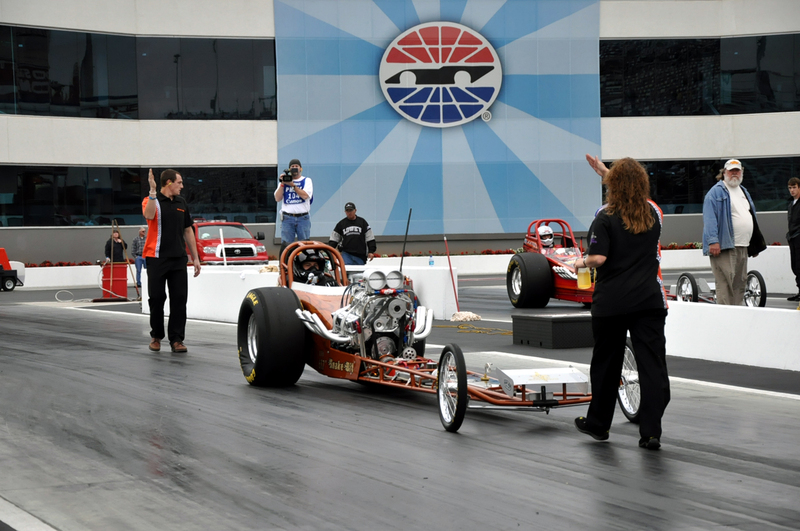 The Gospel Motorsports team headed back to Bristol Dragway on June 13 to race with the Southern Slingshots at the 2nd annual ?Blast From The Past.? 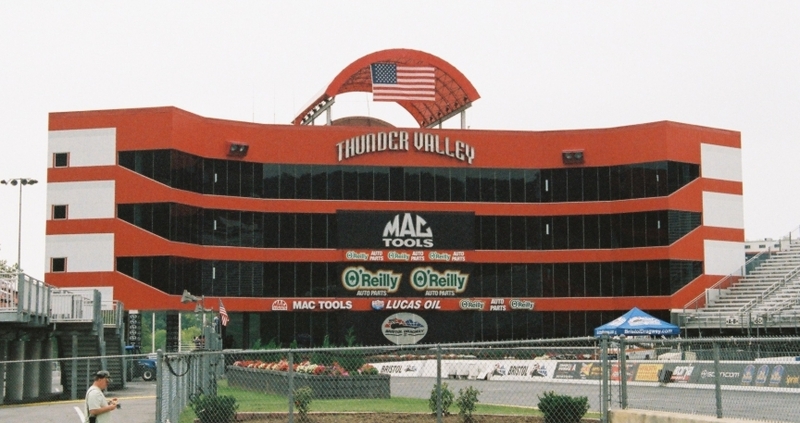 Due to the great experience in 2008, we were anxious to return to Thunder Valley to reunite with old friends and to make new ones. We arrived Friday afternoon to help get the teams parked and pit areas organized. It takes a huge amount of cooperation to get 14 teams parked and settled in to their respective ?temporary homes.? I must admit that I have developed kind of a nasty little racetrack habit. Several times I have promised Jennie to get her to a ?decent? restaurant at a ?reasonable? hour so that we can enjoy a nice dinner. Unfortunately, I get easily distracted by many things?bench racing with friends, meeting new friends, and checking out cool cars. Much to Jennie?s dismay there just happened to be over 1,700 ?distractions? 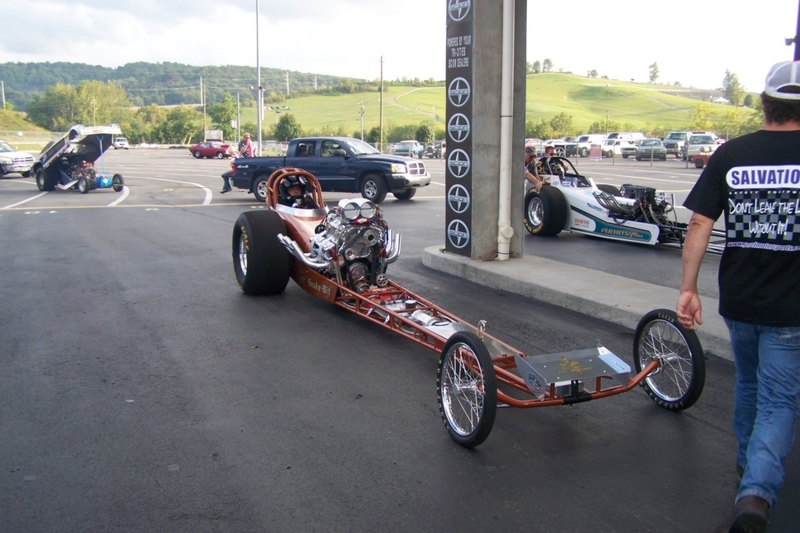 at the track Friday evening as Bristol Dragway was the last stop on the 2009 Hot Rod Powertour. Jennie and I had an amazing time of fellowship with Brantley, Todd, Dennis Ivory and Rick Butterworth once we finally got to the restaurant. In addition to being wonderful friends Rick and Dennis are very talented. They have been so gracious to help us create promotional material by taking photos and shooting video. 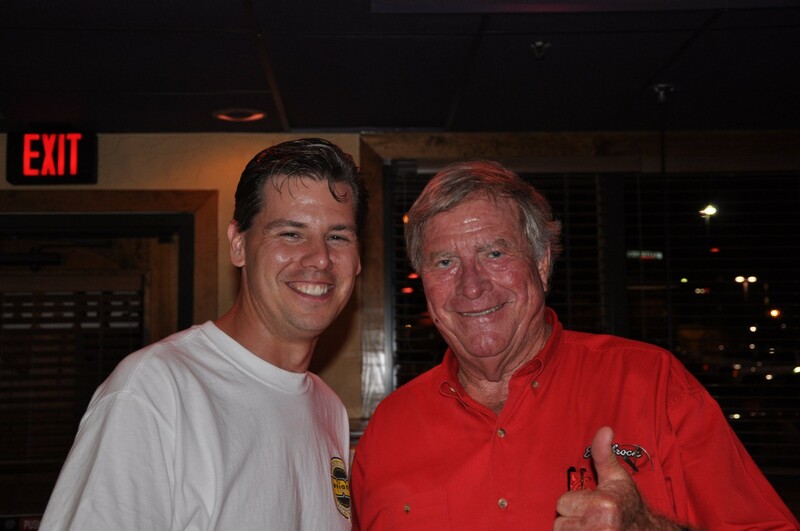 Oh yea, I almost forgot ?we sat at a table across from Vic Edelbrock! Saturday began with a rare photo opportunity. The Southern Slingshot teams lined up in front of the tower for a group photo. Thirteen front-engine cars side-by-side looked like a magazine cover. While waiting for our turn at the Bristol racing surface, the Gospel Motorsports crew did a fantastic job of meeting fans and planting seeds. A large amount of magazines, tracts, and handouts were given away which is the REAL reason we do what we do! The time finally came to run. We were assigned the mega fast ?Moonshine Express? with Justin Prater at the wheel as an opponent. 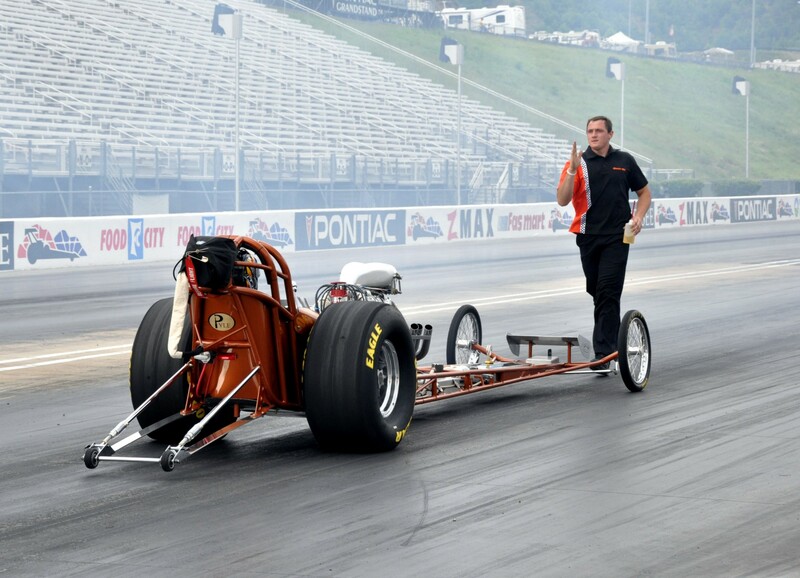 One of the biggest safety concerns with a front-engine dragster is keeping the oil and fluids contained. When engine oil escapes, it impedes vision and affects traction. That? s exactly what happened during the first pass. Pressure from the blower pushed out an intake gasket at about the 1000? mark. The remainder of the run was aborted and I ?coasted? through the lights with a 7.54 elapsed time. Since the next round was scheduled an hour and a half later, there was no time to make the necessary repairs and our racing was done for the day. 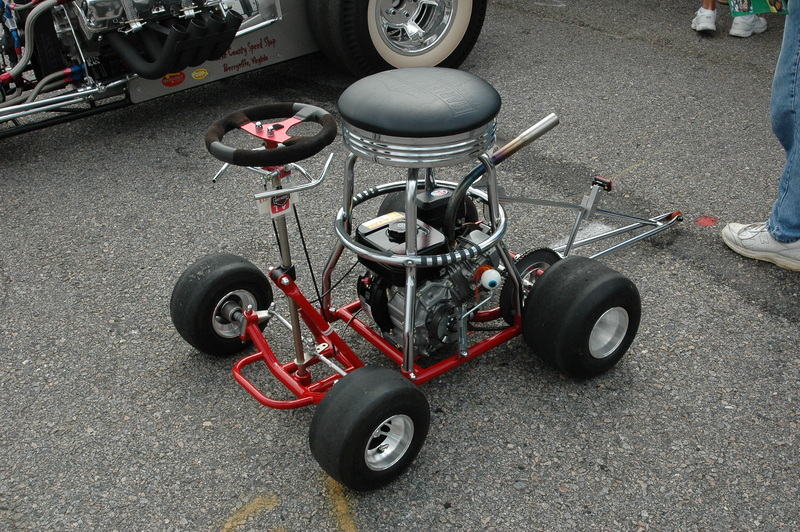 The 1st annual Little Guy Nationals at Virginia Motorsports Park was scheduled to be a two-day event. There was much to see and do?until the rain came. Nonetheless, Gospel Motorsports was very well represented and had a great weekend. Jen, Brantley, and I arrived Friday afternoon and met up with Dennis and David Ivory. We are very blessed to have met Dennis last year. Meeting him was one of several ?divine appointments? we experienced in Bristol last year. They traveled over 700 miles round trip to give of their time and photography talent. 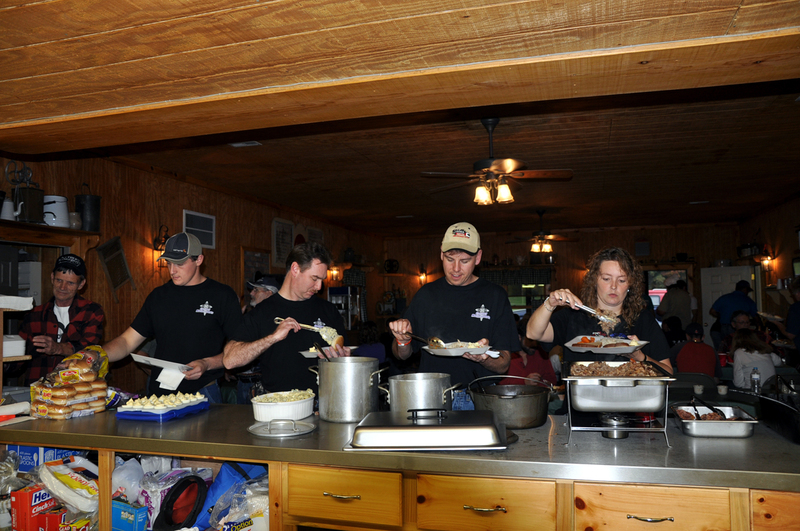 The track provided a free BBQ dinner for all of the participants Friday evening. We sat with Jim Lyle and before long a ?mini-Church service? broke out! Darryl and Nate arrived Saturday morning in Virginia. After several schedule changes due to the impending rain, we were able to relax and enjoy each other?s company, making some new friends, and of course check out all the cool rides. Everyone kept busy with a ll of the tasks to keep the racing schedule. Darryl made time runs with the Nova and Adam and crew readied the digger for an evening match race. There is no way this can be done without lots of help. We are so fortunate to have a great group of dedicated family and friends that make this all possible! When ?showtime? arrived, all of the preparation paid off. 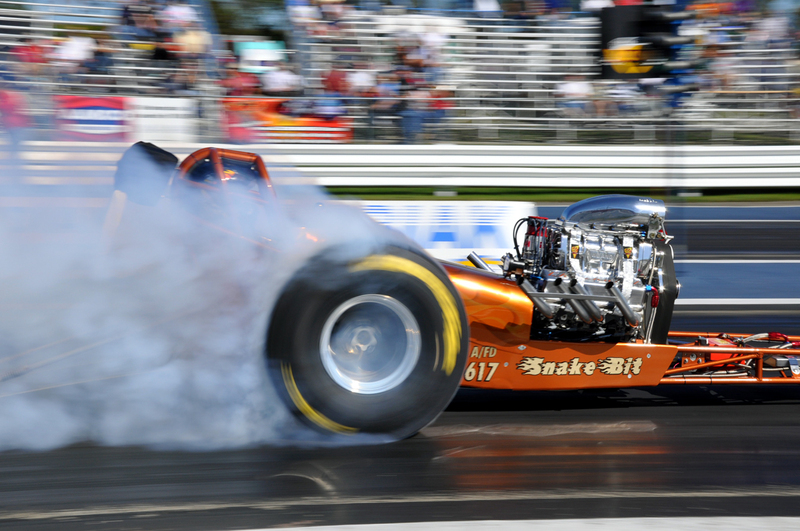 Snake-Bit broke in a new pair of slicks that produced a lengthy burnout to the appeal of the spectators. While in the staging lanes, a fellow racer approached Darryl and humored him as he said, ?I?m not afraid of the Gospel!? At first taken in jest, perhaps this racer was showing his own pride and was an example of Proverbs 16:18- Pride goes before destruction, a haughty spirit before a fall. Darryl didn?t have to face that racer specifically, but after a year off from driving, he went on to win the Street Rod class?coincidence? There was a great time of fun fellowship at the ?late-night Italian victory dinner party.? Its quite possible fatigue is to blame for all of the ensuing silliness at the table, but it was a time we all will not soon forget! As expected, the skies opened Sunday morning, cutting our weekend short. We did manage to enjoy the church service offered at the track by Collis Bryant as the Gospel Motorsports team, members from the Southern Slingshots, and others participated. 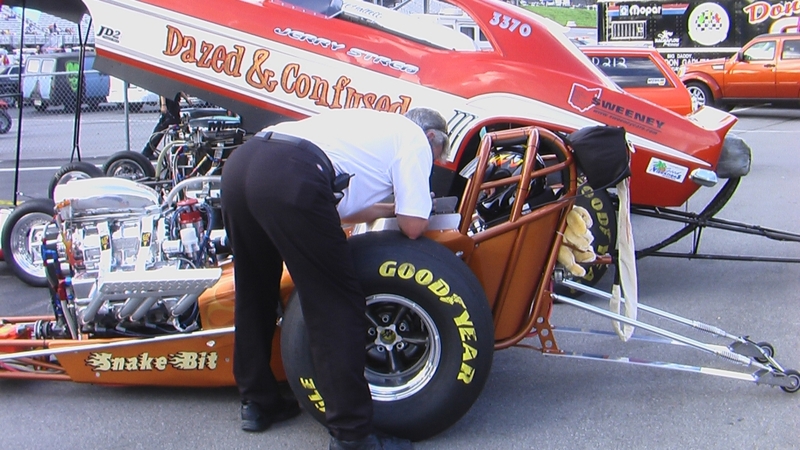 Racing with the Southern Slingshots, team Gospel Motorsports was at the historic Bristol Dragway September 6-7, 2008 for the 1st annual ?Blast From The Past at Thunder Valley.? The beautiful Bristol facilities are impressive to say the least. The size and scale of a 1/2mile-circle track that seats 165,000 must be seen to believe. The equally grand dragway sits between two mountain ridges just to the South. Jennie and I were accompanied to Bristol by our good friends Brad and Tina Smalley and daughter Shawnee. We spent much of the day Friday in the truck enjoying each other?s company and making gas stations along our path very happy. After celebrating Shawnee?s 16th birthday Friday evening, we arrived at the track Saturday morning ready to race. The remnants of hurricane Hanna gave us a lesson in patience by supplying us with on and off showers through the early afternoon. 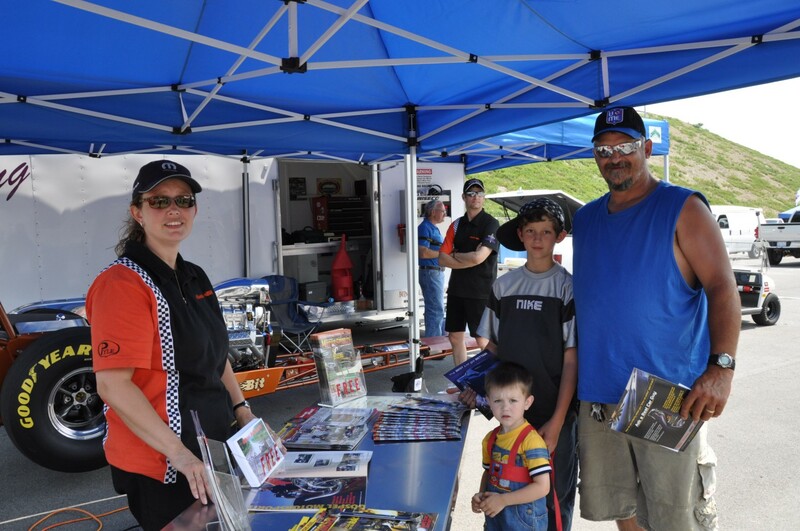 This was a blessing in disguise in that the waiting provided us the opportunity to talk to race fans of all ages and pass out lots of free Gospel Motorsports information. Our experiences have proven to us over and over that there is no such thing as ?coincidence? in life, there is only ?divine appointments.? The weather delay turned out to be full of divine appointments. We met Dennis Ivory, a Christian brother from the Bristol area that gave us a spiritual ?shot in the arm? with words of encouragement for our evangelistic efforts. Another example was meeting Scott and Lesa Trent. 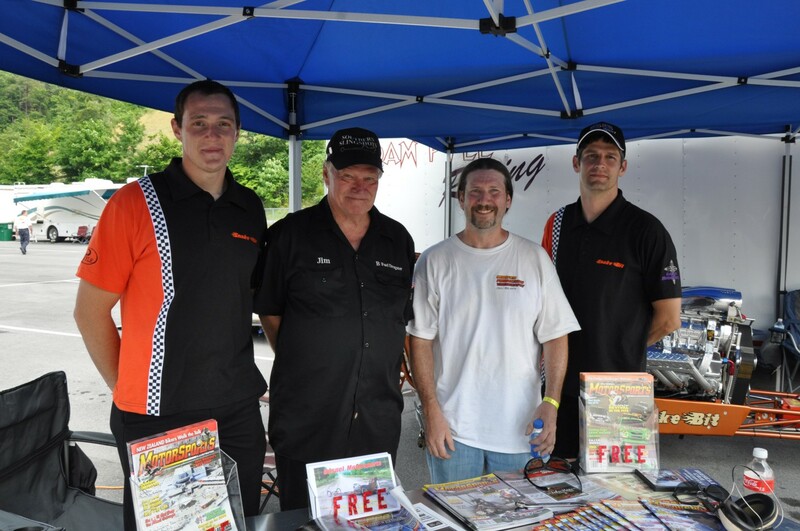 They are the RFC chaplains at Bristol Dragway. I have never had an opportunity to pray with a chaplain in the staging lanes. I always say a prayer before a run that the outcome will somehow bring glory to God, but having a big guy lean down, grasp my hand, and pray together was awesome! We raced the lightning fast J/F car owned and driven by Pat Malloy all three of our rounds. Its fortunate for us that Pat lit the red bulb because he had our E/T covered by a ton! Brad?s previous racing experience helped us discover a problem with the magneto that allowed the timing to slide back 15 degrees from where it should be. Our final race happened at 11:30pm. We were confident that our now correct timing would result in a good close race. At the hit of the throttle, our car jumped out in front, and was hanging right with Pat?s car until at about 1000? my vision was impeded by helmet visor fog from the cool night air resulting in an early shut-off. Even though the team did it?s best to pack everything back in the trailer in a timely manner, it was past 1:30am when we arrived back at the hotel. Church service began in 7 short hours. We just weren?t sure if we could make it back to the track in time for church. My eyes opened refreshed and rested at 7am?What!? Adam Pyle is NOT a ?morning person? Why can't I go back to sleep? A minute or two later, I received a text message from Brad. He too was also unable to sleep anymore. Coincidence? Brad and I decided we would let the ladies rest up at the hotel for the 9 hr ride home while we went to the track, attended chapel service, and hooked up the trailer. When we arrived at the track, it was quiet and peaceful. On our walk to the stands for services, we found another member of the Southern Slingshots, Jim Lyle, was also awakened unusually early. After some small talk, we invited Jim to chapel service. He hesitated, briefly, but then agreed. Following a great message from Scott, it became clear why we all were there. We had a divine appointment! Jim shared with us that he had not been to church in 25 years. He felt that this meeting was the whole reason for his trip to Bristol. It is difficult for me to put into words what exactly we were experiencing in those moments, but I truly believe ?something? happened. The Lord began a work that morning. According to Philippians 1:6 He will finish what He starts! I pray that you will join with us in asking the Lord for discernment to recognize future ?divine appointments? and take full advantage of them. Great Fun & Celebration at 2nd Annual Father's Day Car Show at Shepherd of the Hills Church! 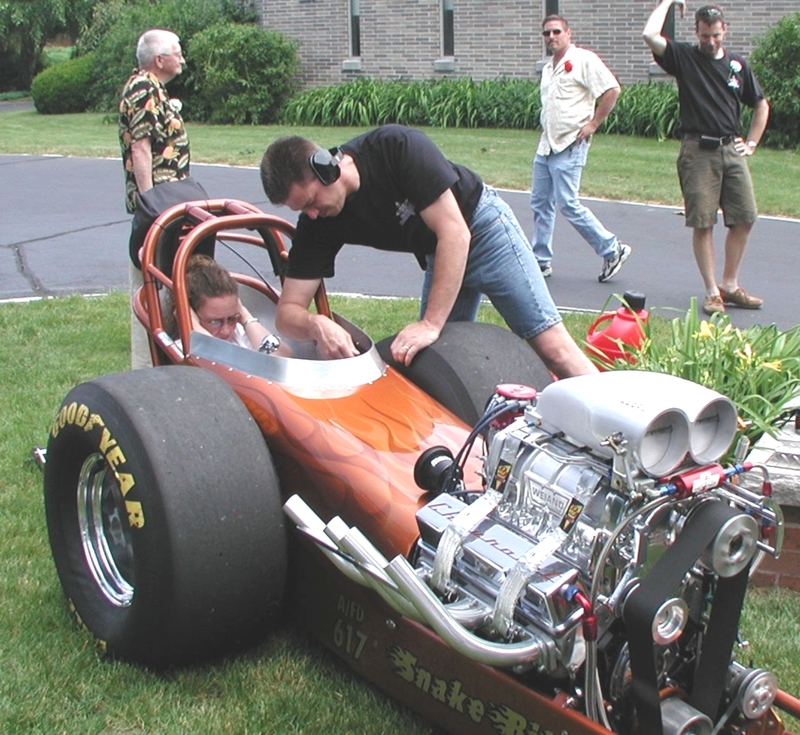 June 15, 2008 was the date for a new and different experience in Bechtelsville, PA. Shepherd of the Hills Church was host to over 6000 horsepower pounding across its lawn to celebrate Father's Day. The cars covered the decades from the 30's all the way through the 80's, and included street cars and race cars. The day started with a few clouds but soon cleared as the event grounds started to fill in. Volunteer Denise Borchelt did a great job handling the registration duties. After the 10:15 service, church goers and passers by stopped in for refreshments of hot dogs from the expert chefs, Neil Schueck and Brad Smith. They could then top off with Dunkin Donuts or home baked goodies from the refreshment committee at Shepherd of the Hills. Karen Schueck, Kevin and Steph Houck, and Tricia Moser kept the sodas and water flowing so everyone stayed hydrated as the day warmed up. After everyone managed to get their fill, it was time to experience the first cacklefest in Bechtelsville. A brief explanation of the origins of a cacklefest and prayer of thanks to the Lord for the day was provided by Darryl Moser. 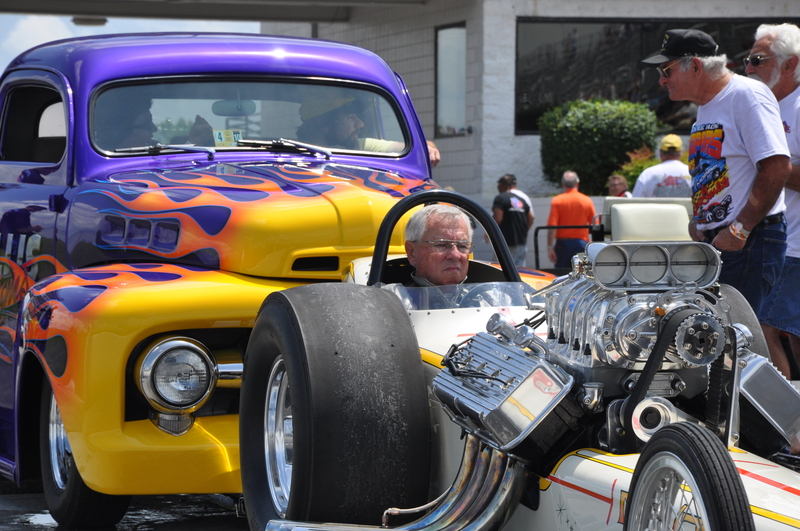 The first call was put forward and the car show participants fired their motors first, with Steve Oteri's blown '57 Chevy and others raising the RPMs to the Lord, to be followed by the junior dragsters from the Pray Hard Racing Team. 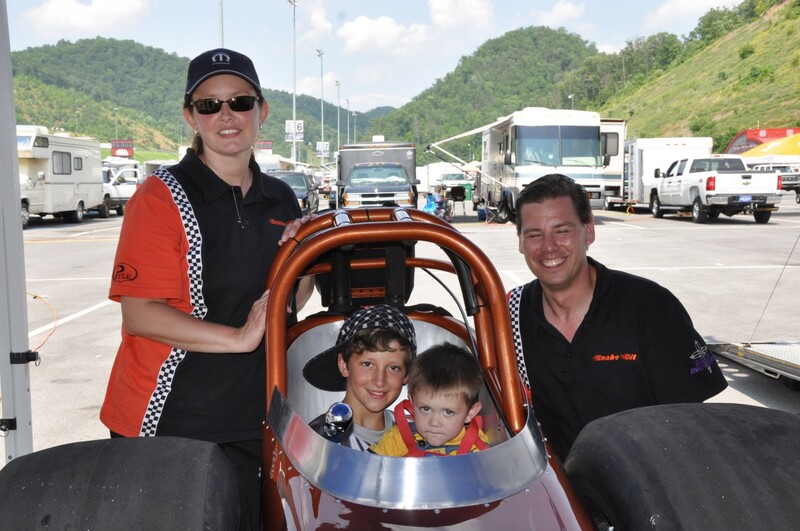 Adam and Jennie Pyle from Gospel Motorsports who traveled from Somerset, PA with their blown and alcohol injected dragster, Snake-Bit, fired up their 900 horsepower to close out the celebration with an exclamation mark. 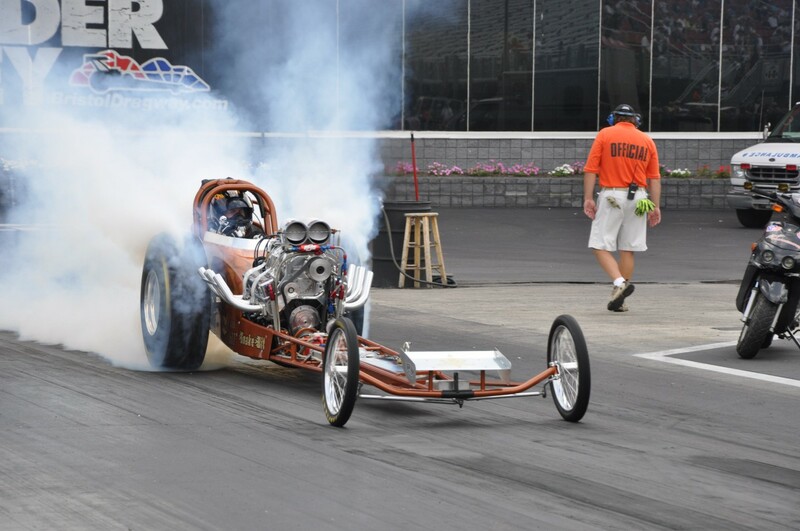 The fuel for the dragster was a special mixture for the day that included 20% nitro, just enough to provide the old time cackle found in early drag cars. The motorvated music was a great celebration in the Lord's honor and to recognize Father's Day. Then came time for the crowd to get into the act as signups were taken for both the kids and adult tricycle and scooter races. The kids did a great job and each received a Hot Wheels car for their participation in the event. 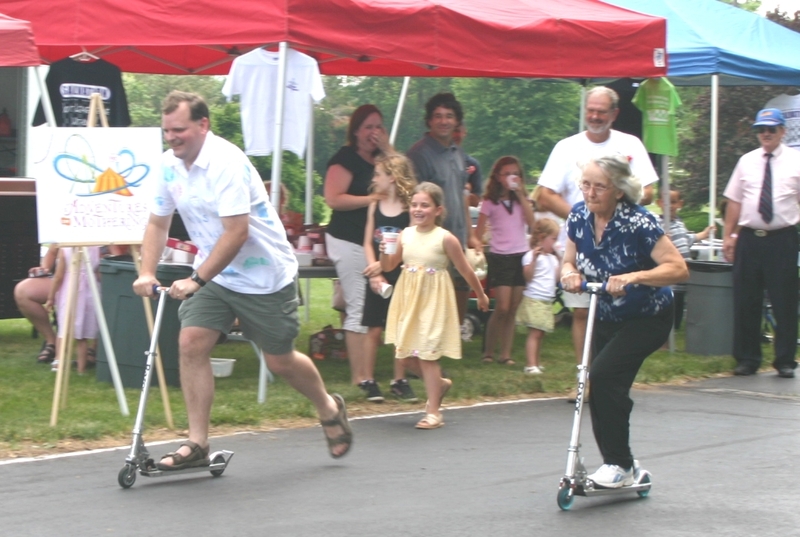 The adults came w ith a fierce competitive spirit in the scooter races where the racers were paired off to scooter a short distance of about 100' around the starter, then back to the finish line. The turnout was great and resulted in splitting the field into two classes. Up for grabs was a Gospel Motorsports' t-shirt of their choosing. At the end of the event, Joe Dedrick overtook Josh Wilson for the win in the adult class, and Jacob Moore took the win over Trent Wilson in the kids class. The rest of the afternoon was filled with music and fellowship as a few more show cars rolled in and doubled last year's attendance, reaching just over 20 cars. 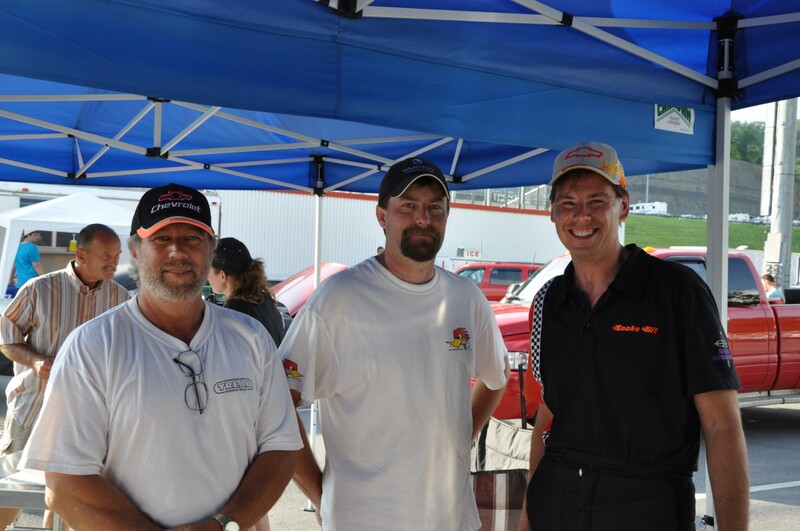 Of special note was a visit by the father and son team of Chuck and Jeff Moyer. 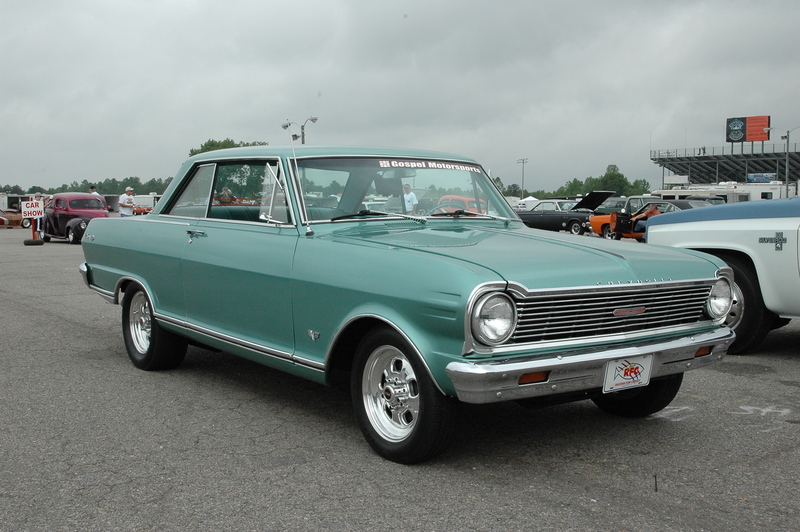 Jeff's car drove to the event, but is also capable of bumper scraping wheel-stands at the drag strip with runs in the 8 second range at over 160mph. The event also included opportunities for attendees to learn about the Shepherd of the Hills Christian Pre-School and the Mother's of Pre-Schoolers (MOPS) programs at Shepherd of the Hills. The youth group H2O (His To Own) also gave an opportunity for attendees to sign up and donate to their fund raiser, Relay For Life to find the cure for cancer that will be held at the Boyertown High School June 27-28th. 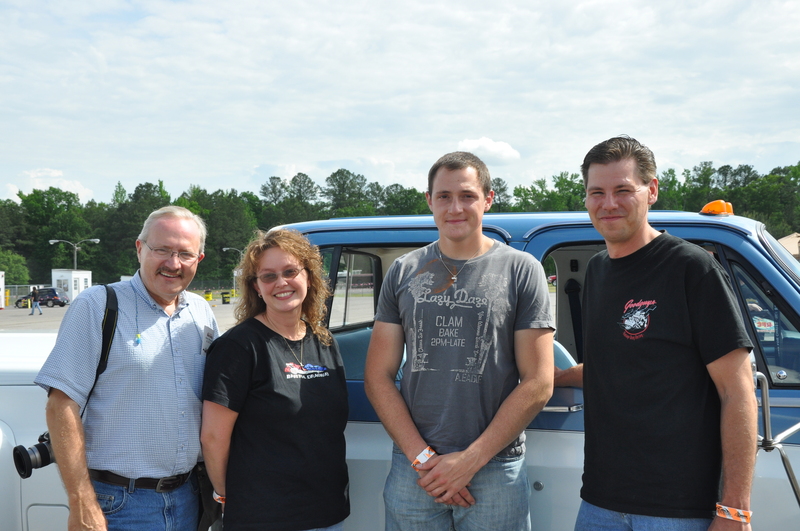 All proceeds from the Gospel Motorsports' shirt sales for the event were also donated to the Relay for Life. Many thanks to all of those contributors and volunteers who were part of the event for these valuable causes. We found many ties to early drag racing in the Shepherd of the Hills' congregation as Jake Arms in addition to having his chopped '81 F100 with a 429 in the show, he also manned the fuel squirt in the injectors to Adam's car. Little did we know Jake used to race Jr. Fuel in the early days of drag racing. 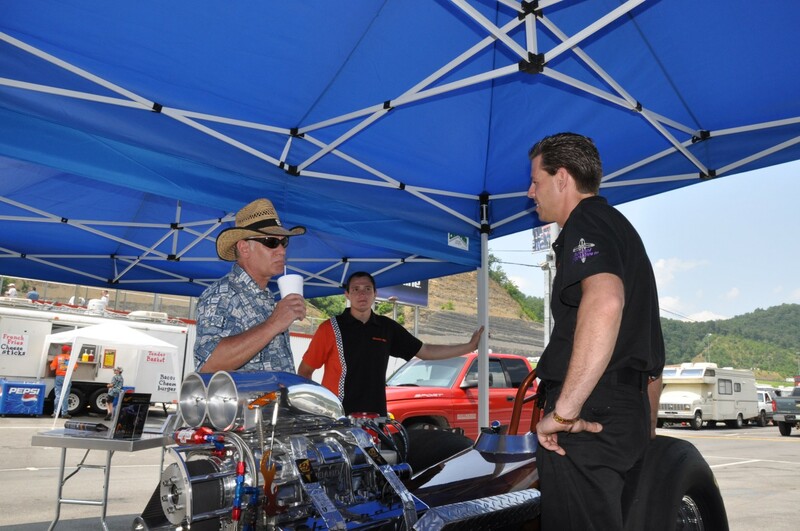 Gospel Motorsports provided a newsletter for the event that can be downloaded here. Many thanks to all participants in the event as they made it a great day for all. 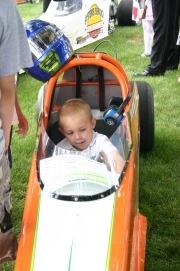 Whether you were a volunteer, showed your car, participated in the races, or just enjoyed the fellowship, your presence was greatly appreciated and we look forward to our third annual event next Father's Day. Show Cars, Race Cars, and all Vehicles welcome to show. Fun for family and fathers of all ages. If you're not going racing, what better way to spend a Father's Day than at a car show with food, music, and fellowship. Race cars welcome to show with trailer parking. All cars are invited to participate in the cacklefest where we will simultaneously fire all car's engines at the show and raise our RPMs to the Lord. King David celebrated with unique dance and song as found in 2 Samuel 6:14-15. What better way to celebrate than to use instruments that a father could enjoy, harnessing all that horsepower and sending the music to our ultimate Father God. You can also sign up to race in the tricycle races and try to generate your own horsepower and challenge our pastors at Shepherd of the Hills. Most of all we look for your presence to make this event a great time of fellowship and worship of our Lord Jesus Christ.